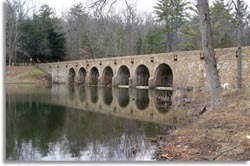 Cumberland Mountain State Park is a 1,720 acre park just outside of Crossville, Tennessee. Park Activities Include: fishing, hiking, camping, picnic tables & shelters, play grounds, restaurant, cabins, basket ball, 4 tennis courts, softball field, paddleboat & canoe rentals and more. Directions: Take Interstate 40-East from Nashville, West from Knoxville-Exit on #317. Travel south on US Hwy 127 for 9 miles, park entrance is on the right. Camping: There are a total of 147 campsites available at Cumberland Mountain State Park on a first come first serve basis. Each site has hook-ups, picnic tables and grill. Bathhouses with showers are also on site. Hiking: There are about 10 miles of hiking trails at Cumberland Mountain. One of these trail has a backcountry campsite. A growing collection of pictures from in and around Cumberland Mountain State Park near Crossville Tennessee.